Cellini Romanesque is is Delicate and Rich. 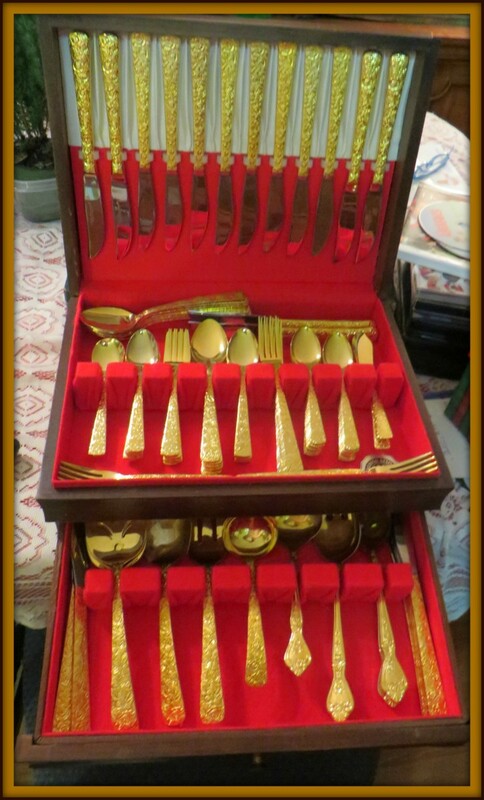 For a real celebration one needs to use Cellini, Romanesque Pattern Electroplate Golden Flatware made in Japan. It is delicate, rich, and leaves a nice tasteful impression for your guest. The Japanese art of gold plating is a method of depositing a thin layer of gold to the surface of another metal, in the case of the Cellini Romanesque it is stainless-steel. 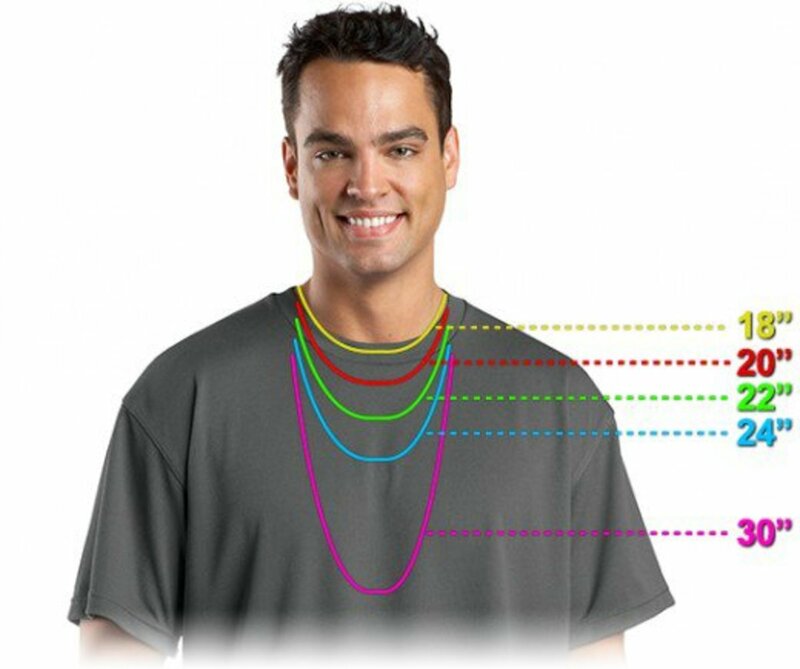 This is done by the way of chemical and electrochemical plating. The place settings and other pieces were processed in the cover plating method used in the modern Japanese electronics industry of the late 1960s. 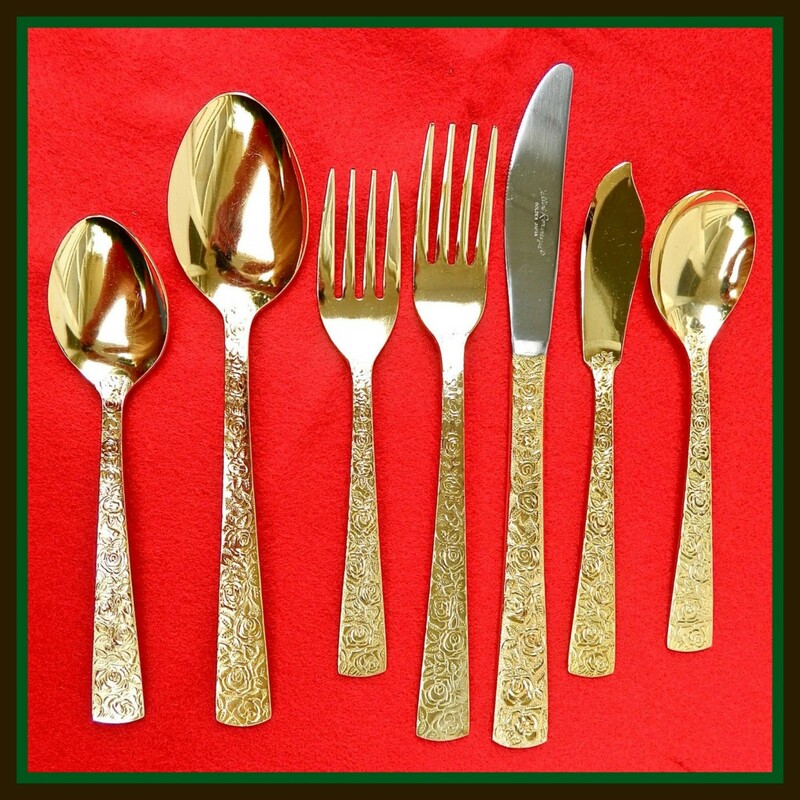 The Japanese method of gold plating of stainless-steel is used in the manufacture of the Cellini Romanesque flatware. 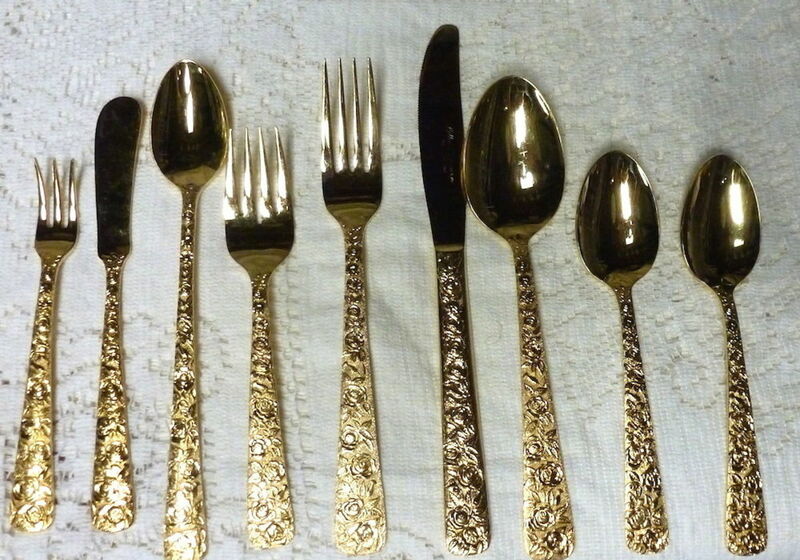 The stainless-steel molecules are diffuse into the gold layer, causing a gradual fading of its color and eventually causing a pure hard and durable 24k golden layer on the surface of the flatware. Cellini Romanesque Salt and Pepper Shakers. Vintage Cellini Romanesque hand cut crystal salt and pepper shakers with their original box. These salt and pepper shaker are hand cut crystal with pretty flower design on the sides. 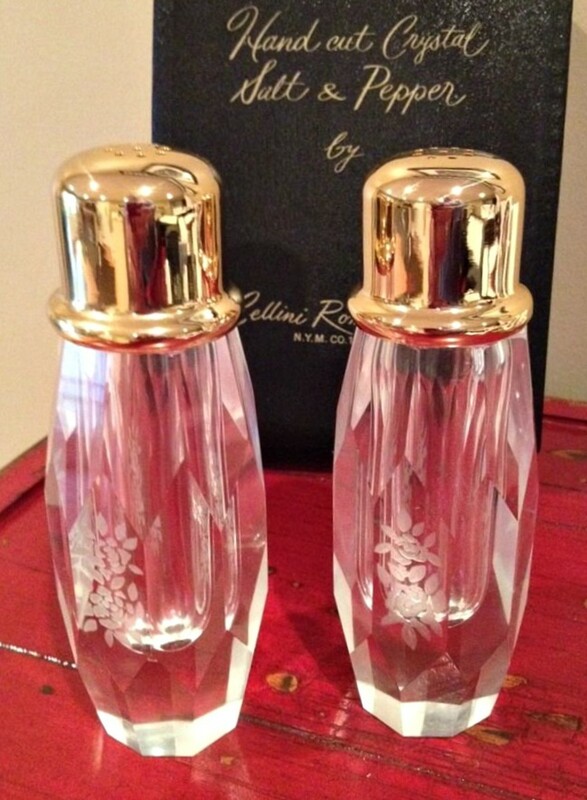 The photo above is of the vintage Cellini Romanesque hand cut crystal salt and pepper shaker with their original box. These salt and pepper shaker are hand cut crystal with pretty flower design on the sides. They are heavy solid and large pieces. They are 5 3/4" tall and 6 1/4" around in the middle. Gold color tops are 24k gold-plated. Cellini Romanesque had master the art of creating hand cut crystal masterpieces since the 1890s. As one of only a handful of master crystal cutters companies still operating in Italy Cellini was a world master of the art. 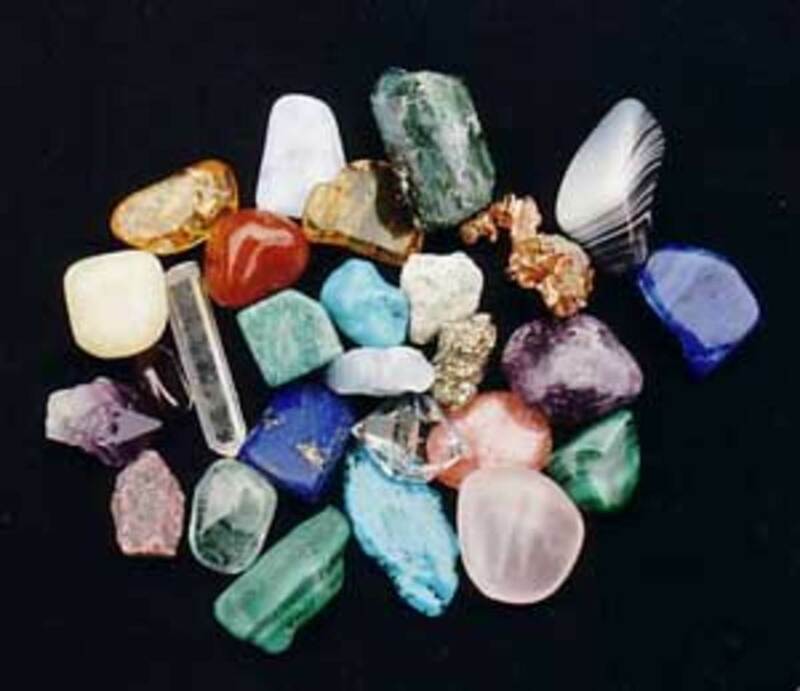 By the 1960s the company had devoted many years in reviving the lost art of amazing diamond like cut crystal as seen in the set of salt and pepper shakers. 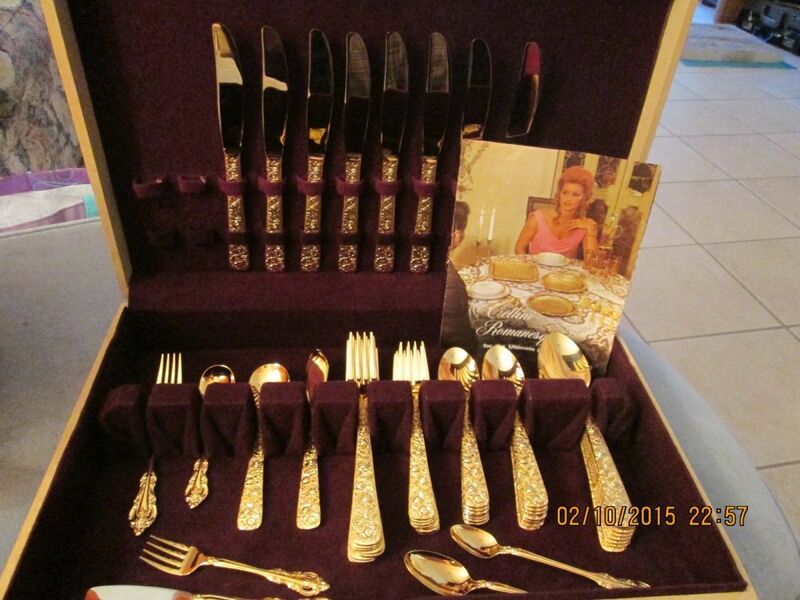 Cellini Romanesque Electroplate Golden Flatware made in Japan. The Road to Modern Flatware was Hard. The road to modern flatware was long and hard. In the Middle East by the 11th century there were many utensils similar to our flatware of today. The knife is one of the oldest and most widely used made by men eating utensil. The spoon developed from the old English “spon”, means a chip of wood, and the early spoons were carved from wood, bone, stone and other materials. Spoons are not new to the world and have been used in the ancient world in Egypt, Greece, Rome, and India. The middle Ages in Europe meals were served on slices of hard bread and only royalty used utensils, which were more for court life than practicality. Cellini Romanesque Serving Set: This set includes Serving Fork, Server, Serving Spoon, Soup / Gravy Ladle, Butter Knife; they are stamped N.Y.M. Co., 1968. Traditionally, good quality cutlery was made from silver hence the U.S. name silverware, though steel was used more for knives. In the 20th century, the creation of gold plating in Japan and Europe help lead the way of strong durable gold platted stainless steel for deluxe tableware. Cutlery is usually known as silverware or flatware in America, where cutlery means knives and other cutting instruments. 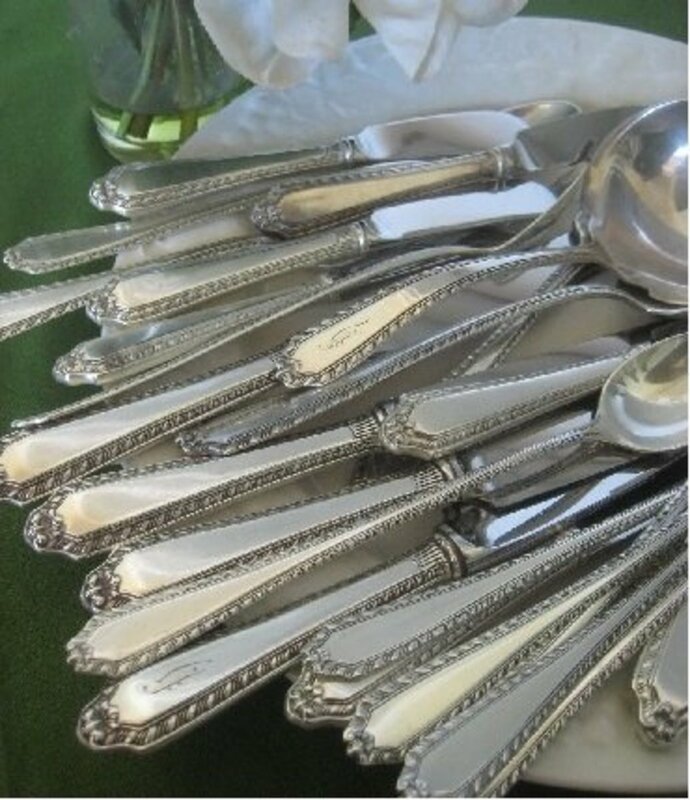 Although the term silverware is used irrespective of the material composition of the utensils, the word flatware came into use to avoid the implication that they are silver. 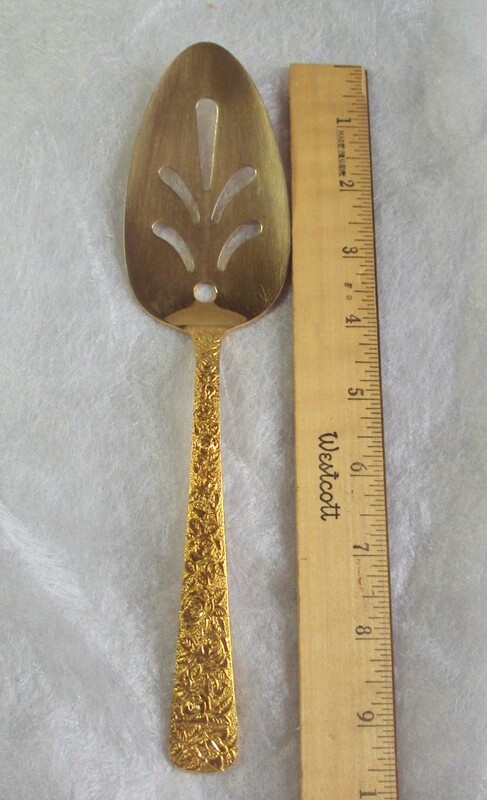 A gold platted rose patterned serving spoon flatware by Cellini Romanesque of New York and made in 1968.It has a glossy finish and it is 9-1/2 inches long. This is a beautiful piece perfect for any festive holiday or celebration table. Tableware is the dishes and cutlery, or we could say the dishware and flatware used for setting a table. These are different all around the world. Serving food and dining are much different in the Middle East than in the Americas. Dining almost always includes flatware, glassware, serving dishes and other important items for practical as decorative use in the western cultures. The quality and nature of tableware and flatware varies in other cultures, and number of the table settings and objects are different from culture to culture, and occasions. For example Polynesian and South Pacific culture the food is sometimes is served with limited tableware that only includes serving dishes. 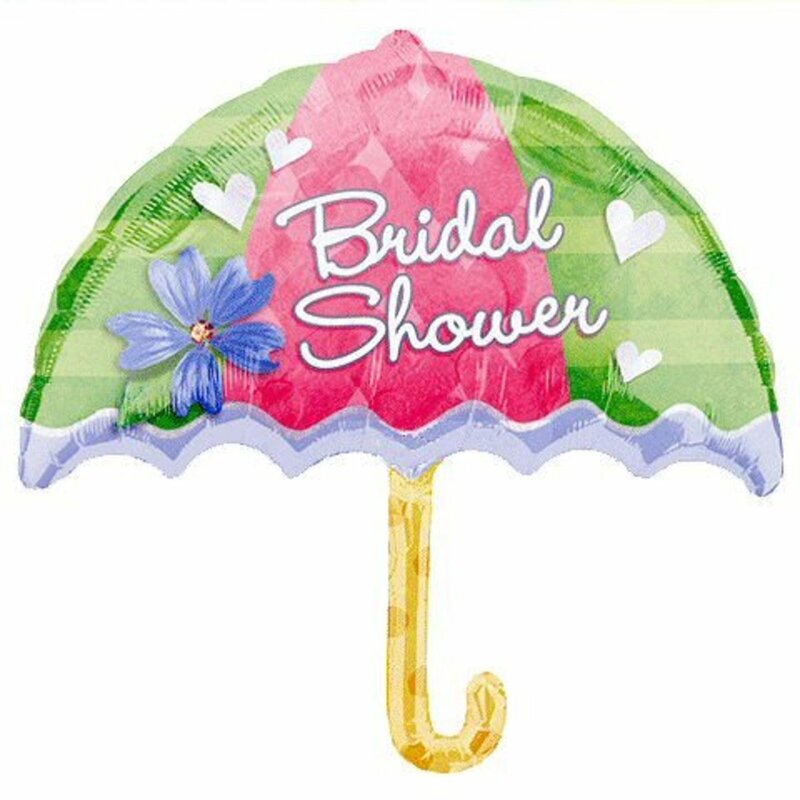 Also special occasions are usually reflected in higher quality tableware throughout the world. Cellini Romanesque was made for special occasions and goes with higher quality tableware. Cellini Romanesque Serving set for Sixteen. Cellini Romanesque Serving set for Sixteen. 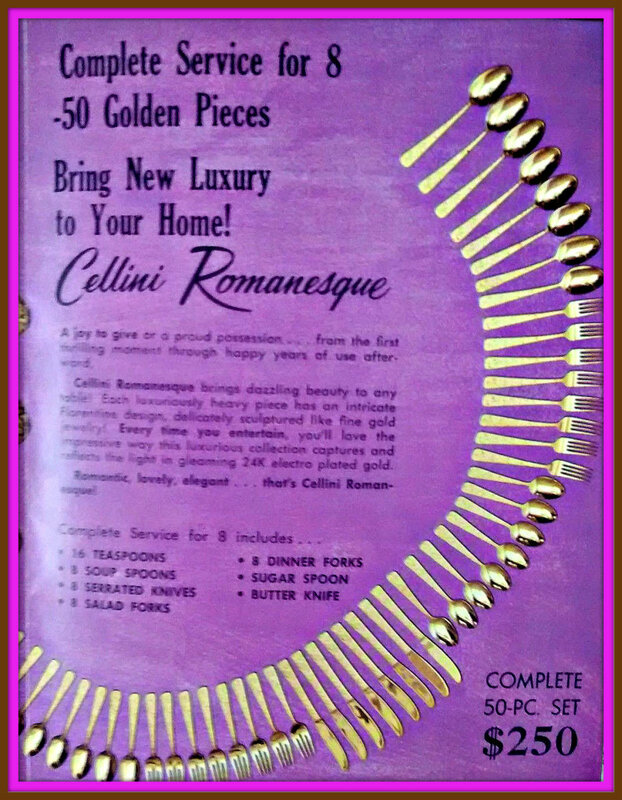 All the pieces are stamped on the back with the Cellini Romanesque logo and the date 1968. This pattern was expired in the year 1992. It is modern and clean and very elegant. High Quality Tableware is a Sign of Wealth. As far back as the ancient Egyptians the ownership of table ware has been a way to determine a person’s individual wealth, and the greater the wealth, the higher the quality of tableware that was owned and the more numerous its pieces. In the the times of the ancient Romans and even now in modern times the more affluent citizens owned fine furniture and silver, while the lower calls possessed only the simplest pottery and kitchen utensils. CELLINI ROMANESQUE design was trademark by New York Merchandise Co., Inc. in New York City in the year 1968. The crystal salt and pepper shakers were made in Italy, and the flatware was made in Japan, also the china was made in Japan. The stemware for this flatware design was made in Italy. Just in time for the Moon landings, this was a delicate Renaissance design for the age of Aquarius, you can see the hope and dreams of the future in this flatware design. The delicate floral design is so richly expressed in the 24k gold. 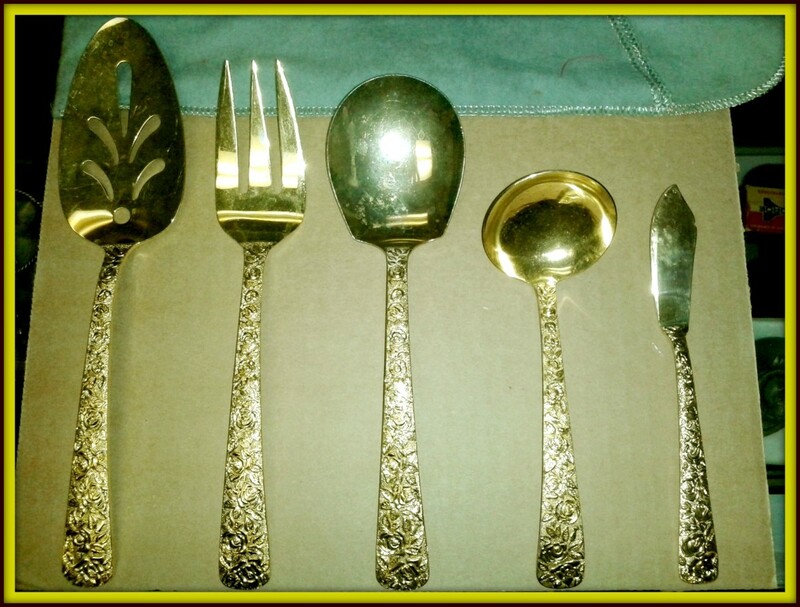 Here is a photo of the complete Cellini Romanesque nine piece place setting: with the Dinner Fork, Salad Fork, Dinner Knife, Soup Spoon, Teaspoon, Cocktail Fork, Ice Tea Spoon, Spreader Knife, Sugar Spoon, and Butter Knife. 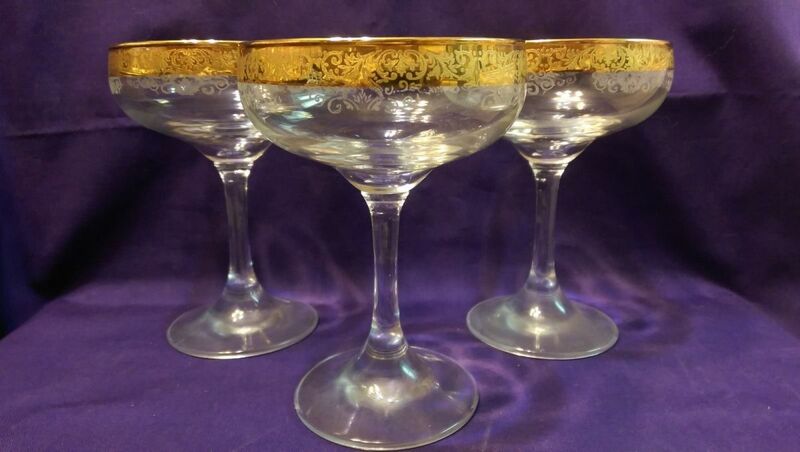 Here is a great example of three Cellini Crystal stemware Champagne glasses in 24 KT gold they were hand decorated Italy. Setting up a New Year Eve Party for Four. Celini Romanesque A joy to give or a proud possession … from the first thrilling moment through happy years of use afterwards; Celini Romanesque brings dazzling beauty to any table. Each luxuriously heavy piece has an intricate Florentine design, delicately sculptured like fine gold jewelry! Every time you entertain, you’ll love the impressive way this luxurious collection captures and reflects the light in gleaming 24k electro plate gold. Every time you entertain, you’ll love the impressive way this luxurious collection captures and reflects the light in gleaming 24k electro plate gold.